Based on specific information the operational parties of 55 Bn BSF at Panisagar and 133 Bn BSF at Nalkata were able to seize a huge consignment of heron worth Rs 53 lakh at Kumarghat Railway Station in Tripura. According to BSF sources, based on specific information about transportation of consignment of heroin or brown sugar, from Assam to Agartala using Silchar-Agartala passenger train No 55664, the operational parties of 55 Bn BSF at Panisagar and 133 Bn BSF at Nalkata were kept ready at their respective locations. Following the information received by the Field ‘G’ team of BSF sector, Panisagar, at about 1:35 pm, Inspector Santosh Kumar along with five members of Field ‘G’ team, sector Panisagar boarded the said train, at Panisagar Railway Station in civil dress, in two groups. One group boarded the front general boggie near the engine and other group boarded the rear general boggie. Both the groups cautiously looked for any suspicious carrier with suspected bag/baggage. At about 2:05 pm, when the train was about to reach Kumarghat Railway Station, an indication was received that the consignment was in a yellow coloured plastic bag and kept in the boggie meant for handicapped person adjoining engine. As the train reached Kumarghat Station, both the teams hurriedly approached the said boggie. The operational party of 133 Bn BSF led by Manoj Kumar, DC along with 2 SOs and 6 other ranks were already present at Kumarghat Railway Station to reach the spot. During the search, the operational teams located a yellow plastic polythene bag under one seat. The passengers were enquired about its possession, but no one claimed it as their own. 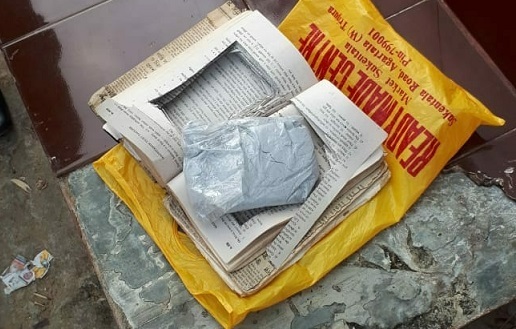 On searching the bag, two books were found inside it, out of which in one book, a packet of suspected heroin powder was found hidden, by making a required cavity in the book, precisely cutting its pages to clandestinely conceal the drug. The operational team seized the bag at about 2:20 pm with suspected heroin packet weighing 265 grams worth Rs 20,000 per gram with total worth Rs. 53,00,000. The seized items were handed over to GRP, Dharmanagar Railway Station, in consultation with due regards to procedural formalities. An FIR has been lodged in this regard.